Chung-Ang University (CAU) set the platform for putting its creative asset to practical use by being selected to receive support funds under the Beyond Research Innovation and Development for Good Enterprises (BRIDGE+) Initiative from the Ministry of Education. The Ministry of Education and National Research Foundation of Korea called for participation in BRIDGE+ Initiative and announced to provide KRW12.52 billion of funding for eighteen universities in 2018. CAU Industry-Academic Cooperation Foundation (IACF) was designated one of the research fund recipients and will be given KRW680 million per year–a total of KRW3.4 billion for a period of five years. 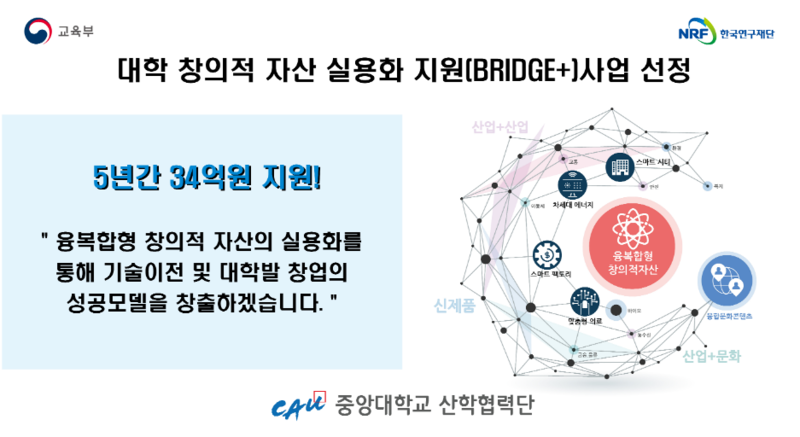 President Kim Won-yong of CAU IACF said, “CAU IACF had successfully established the technological platform to commercialize creative asset through the previous BRIDGE Initiative over the last three years. Based on this, we now become capable of establishing a successful model for the technology transfer and commercialization by capitalizing on our strength in the cultural content sector including copyrights, business ideas, and humanities and arts-related content through the implementation of this BRIDGE+ Initiative. To that end, we will focus mainly on introducing a stage-gate process, establishing a platform for technological convergence with cultural content, promoting cooperative councils with businesses, and operating CAU Technology Commercialization Center in China. We will make the utmost effort to promote technology transfers between the academia and industry and help our students and faculty members who develop promising technology to start a business. In the process, both core technologies leading the Fourth Industrial Revolution–such as smart city, next-generation energy, smart factory, and customized medical service–and convergence with cultural content will be at the center of our focus." The BRIDGE+ Initiative–a follow-up project of the BRIDGE Initiative implemented from 2015 to 2017–is scheduled to be conducted from 2018 to 2022. It aims to promote technological convergence through interdisciplinary collaboration and expand the scope of business which is, in general, limited to intellectual property to other areas such as know-how and idea. This will ultimately enable the university to overcome technology transfer & commercialization-related difficulties and develop a business-friendly commercialization system.